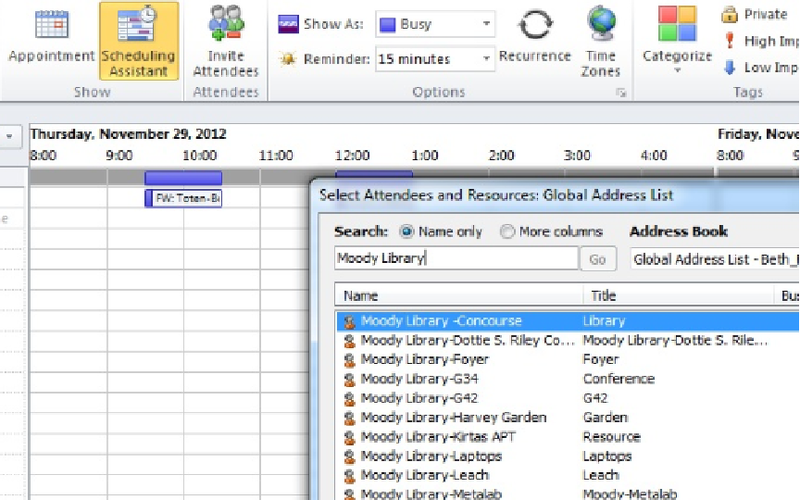 Library personnel are encouraged to schedule rooms through Outlook. Central Libraries Meeting Room Calendars are open and viewable to you. Our public service staff can assist patrons more easily if full and accurate information is logged in the room requests. Instructions for Outlook 2010 / Windows. Highlight the room you wish to request, and click "OK". You can then see the availablity of the room in conjunction with your other invitees. Once you complete the meeting invitation, the room request will go to the approver and you will receive a confirmed approved response just like you would get from individuals you invite. Please help by ensuring full and accurate information. Since the information you typed into your meeting invitation populates the room schedule, it is important that you suppy full information. Subject Line: enter as much information as possible. For example, if this is a class, course # and faculty name. Notes: add contact name and information in case of scheduling changes. Instructions for Outlook for Mac 2011. Continue process by following steps 6 - 8 above. If you need assistance or have suggestions, please contact Library Facilities (library_facilities@baylor.edu).